What’s your favorite music? Seems like a simple enough question. Discovering the songs and other music most loved by someone in your care is at the heart of the MUSIC & MEMORY® personalized music program. But the answers aren’t always obvious and, sometimes, they’re downright hard to get, especially when the person you’re asking has Alzheimer’s or another form of dementia—or if she’s from a foreign country that’s unfamiliar to you, or if he simply has trouble explaining what he’s remembering (“it was a song about black, wavy hair”). The best approach, says Letitia Rogers, Music & Memory’s Regional Coordinator in Southern California, is to become a “music detective.” Letitia spent nearly 20 years working on Hollywood movies, as an assistant to composers, music agents and music editors, helping to pick music for film soundtracks. “There were projects like searching for Polynesian/Hawaiian/tropical-island-sounding music for Lilo & Stitch, to finding 1930‘s Chicago blues for Public Enemy,” she recalls. Did you listen to music when you were young? Did anyone in your family play music? Did you? What song did you dance to at your wedding? Do you have any favorite music from attending a place of worship? It’s always worth it to ask basic questions like these, because they may open the door to a longer, deeper conversation. But don’t be discouraged if you don’t get very far, since these questions are quite direct. Sometimes the individual won’t know the answer right away, or sometimes she won’t be able to recall because of her particular cognitive challenges. 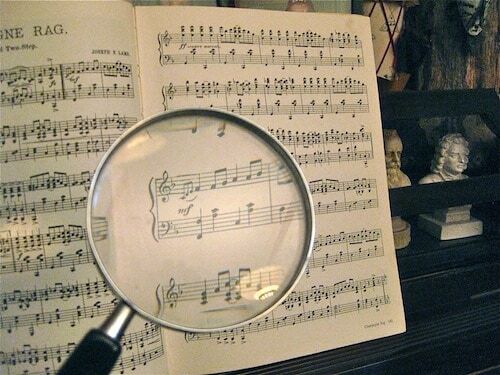 That’s when you need to hone your music detective skills and look for clues. “A dementia patient I worked with at first said she didn’t know what kind of music she liked. Then I asked, ‘I was told you moved to Hollywood in the early ’40s. Did you ever go out when you were there?’ She shared that she remembered taking dance lessons with her brother. Sometimes all you’ll get from your initial questions is a phrase and a general guess of the type of music: “It was something about wavy black hair or waving black hair. It was an old country singer from when I was young.” If the individual is in his 90s, you can make an educated guess that he might be thinking of music from the ’40s. One approach is to do an Internet search, using those clues as key words. Try them in varying combinations. A search for “waving black hair country music” pulls up several listings for Wildwood Flower, including a listing on Country Music Treasures with the lyrics and a quote by Mother Maybelle Carter of the original Carter Family, who recorded the song: “It’s the most popular song we ever recorded, and there’s hardly a country group who doesn’t use this song.” Given that the Carter Family recorded in the ’30s and ’40s, chances are you’re on the right track. What If They Can’t Communicate? Educated guesswork is key to success. If the person in your care can’t communicate or struggles with memory, your best bet is to find out as much as you can from other sources about the individual’s background. In addition to age, find out where the person was born, where he lived over the course of his life, and his first language. You may be able to find out about favorite hobbies, sports and other pass-times that could suggest a starting point. What radio station do family members recall him listening to? What TV shows? Was he musical? Did he play an instrument or sing in a choir? All of this information can help you solve the musical favorites mystery. If the individual speaks a different language, start with family members and friends who may be able to interpret. Staff members may be of help with translating, as well. If you meet some resistance and skepticism about your knowledge of another culture’s music, don’t let that dissuade you. Do your homework. Search the Internet for “top [name of country] singer of all time” and see what turns up. Armed with the name of a famous Arab singing artist, Letitia was able to convince the son of an Iraqi dementia patient that she was serious about finding music for his mother. Then, working through a staff interpreter, with the son’s help, she asked the mother if she preferred music with instruments, or with words and singing. “Singing,” she said. “Of course,” recalls Letitia. “She was in a place where no one is speaking her language, so in addition to the isolation of dementia and moving into a facility away from her community, she was also losing the sound of her life and her culture.” Soon after Letitia created the playlist, the woman was singing and clapping along with the music.